I rang in the New Year with a newly acquired horse. Her name is Topaz and she's a 26-year old Arabian. But she's not just any ole' Arabian. She's been "retired" from competing in 38 endurance races and placing among the top ten winners 25 times. And ten of those 25 times was a 100-mile event, a route that takes eleven to fifteen hours to finish. This is an athletic horse with much willpower to endure! My very good friend Sally (human below) is boarding Topaz for me, and her horse Glory is Topaz' very good friend. But Glory has never done an endurance race . . . . So Sally's husband Boyce suggested that we retired ladies should introduce Glory (a Missouri Fox Trotter) to a 12-mile non-competitive endurance race at the 7IL Ranch in Cat Spring, Texas. 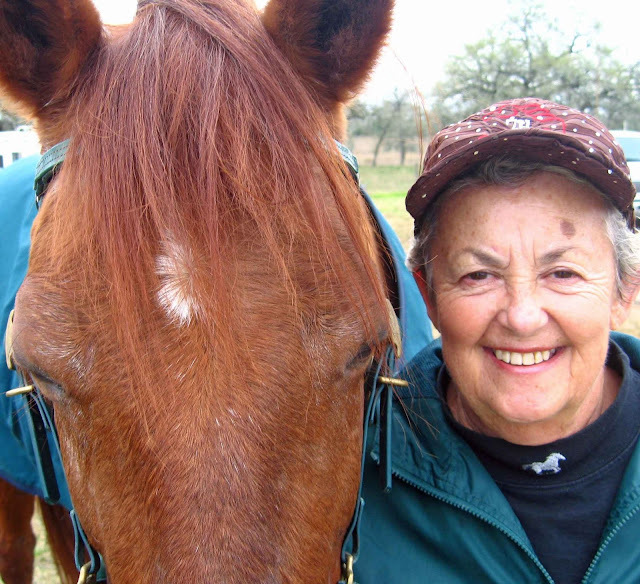 Long ago, Sally rode several endurance races. 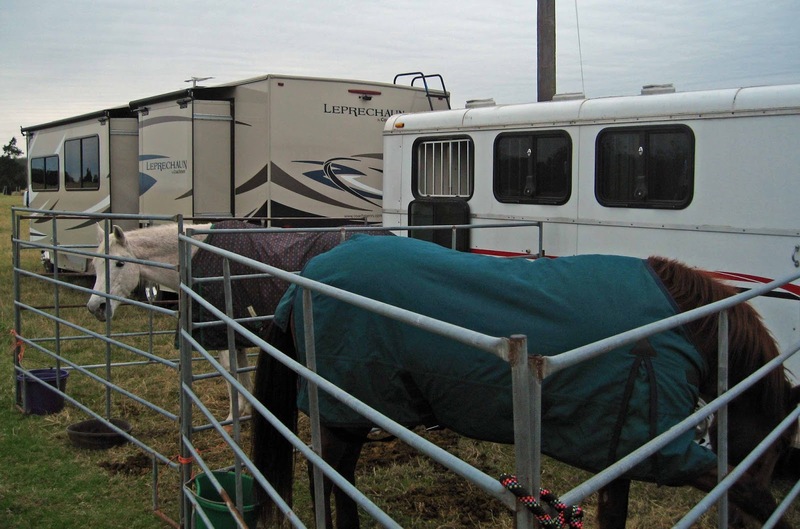 And I had already tried a 25-mile endurance race with my Thoroughbred about seven years ago. An endurance race is similar to a human cross country marathon; you don't sprint fast, you keep a level pace for the duration of the route. And to make sure riders don't cheat and sprint their horses, there are check-points where horses with high heart rates must wait until their heart-rates decline to an acceptable level as determined by the veterinarians. 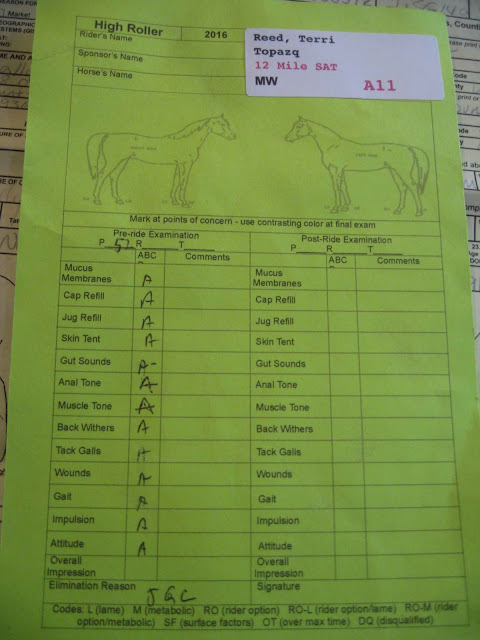 My Thoroughbred was kept waiting a long time because of her high heart rate. During the 25-miler, I couldn't keep her slowed down to a level pace; she was just too competitive and wanted to sprint past all the other horses (she was an ex-race horse). Endurance races are not a Thoroughbred's forte which explains why you seldom see Thoroughbreds at endurance races. Topaz, however, is an Arabian which prefers to trot (not gallop) at a steady pace. She's the favored breed at endurance races. So, I was looking forward to riding a real pro at this 12-miler non-competitive event to be held along with 25 and 50-miler competitive events. Sally and her husband Boyce get their motorhome and horse trailer ready. 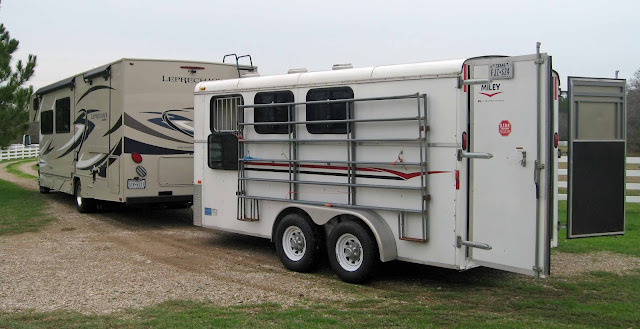 All we need to do now is load the horses. I'll follow in La Lair. 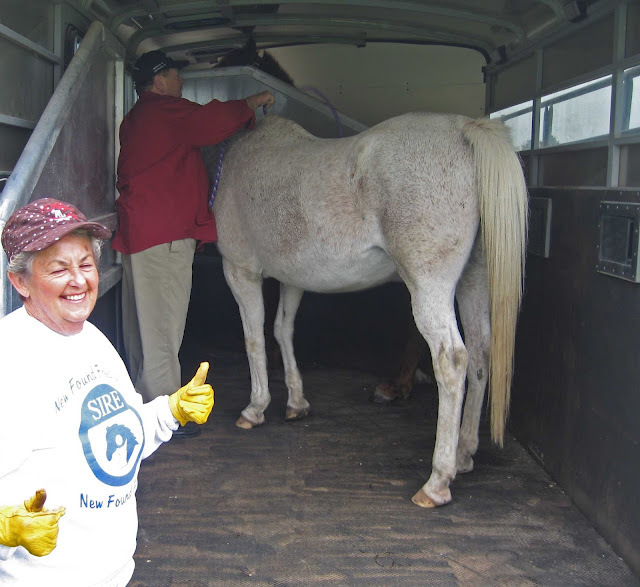 Boyce and Sally have decades of good-teamwork experience at loading horses, llamas, alpacas, donkeys . . . . When we arrive at the 7IL Ranch, we set up the corral. I set up camp on the other side. 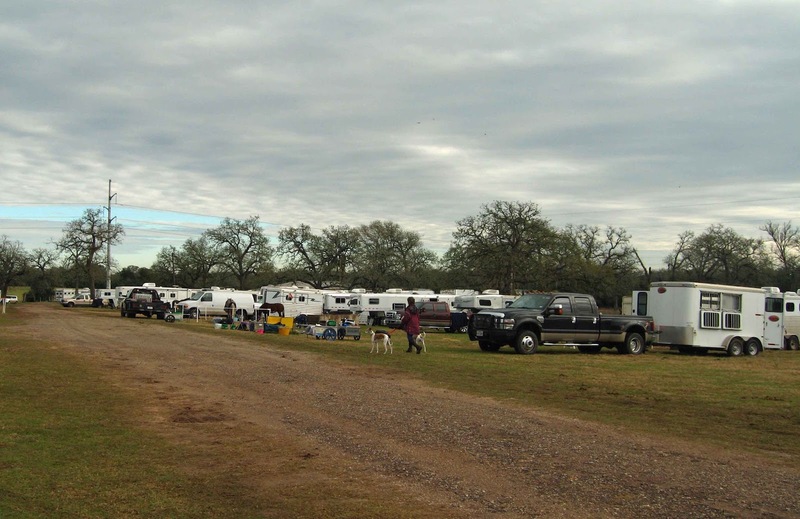 There are about 200 other corral-camp combinations. 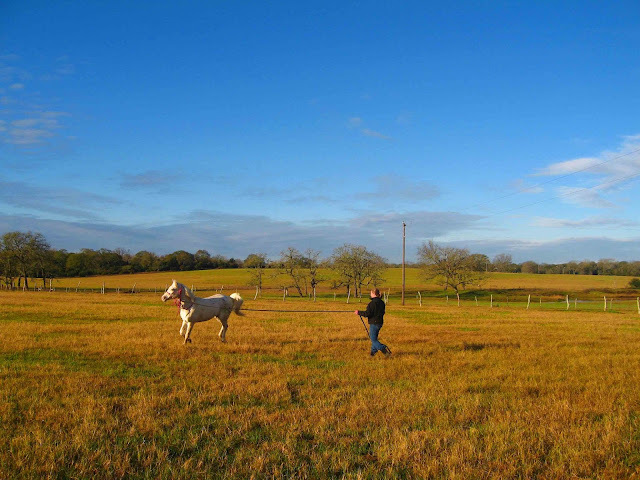 At this 2,000 acre working cattle ranch, there's plenty of space to exercise a horse. 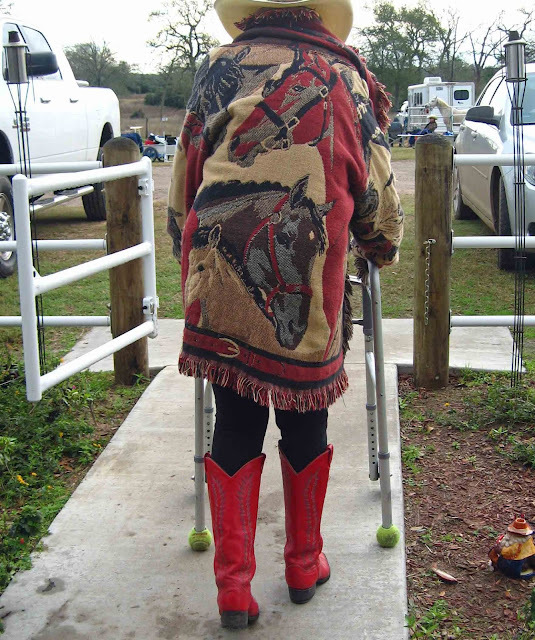 This lady is "lungeing" her horse; it's similar to a warm-up exercise to check the horse's physical and mental state. There were a few spectators there, including this 80ish cowgirl. On the morning of our 12-miler, Sally and I saddle up. I had a few adjustments to make to my saddle as Topaz is smaller than my Thoroughbred. You'll notice my padded vest; don't want any cracked ribs! 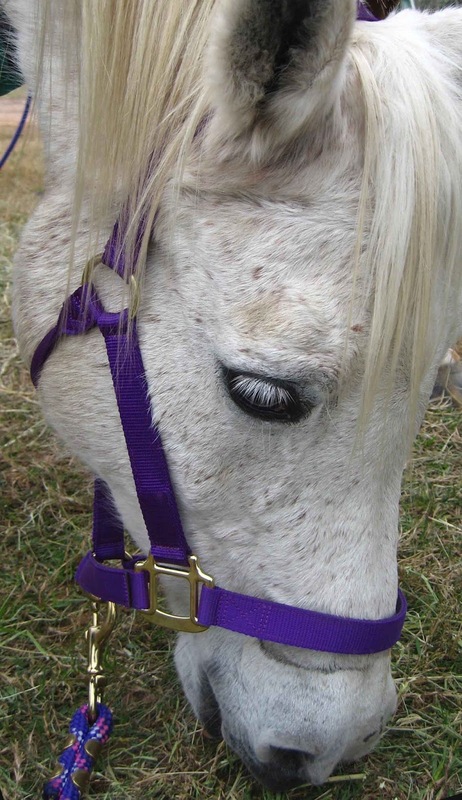 I'm going to try my bitless bridle on Topaz. We stop at the vet check station to make sure our horses are healthy. The vet has a stethoscope and listens to the heart and gut. 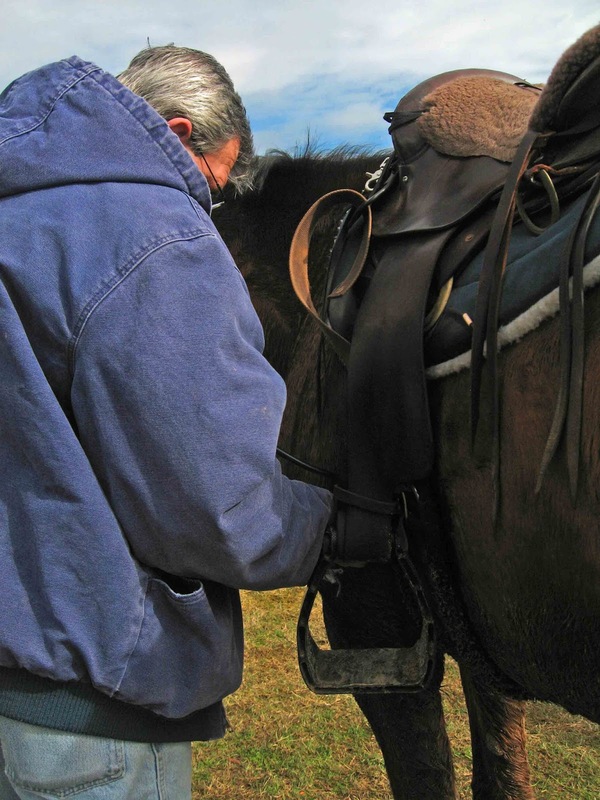 The vet completes the pre-ride checklist for the horse. About three happy hours later, we finish the very pleasant non-competitive ride on two well-behaved horses. And we're all anxious to get home! 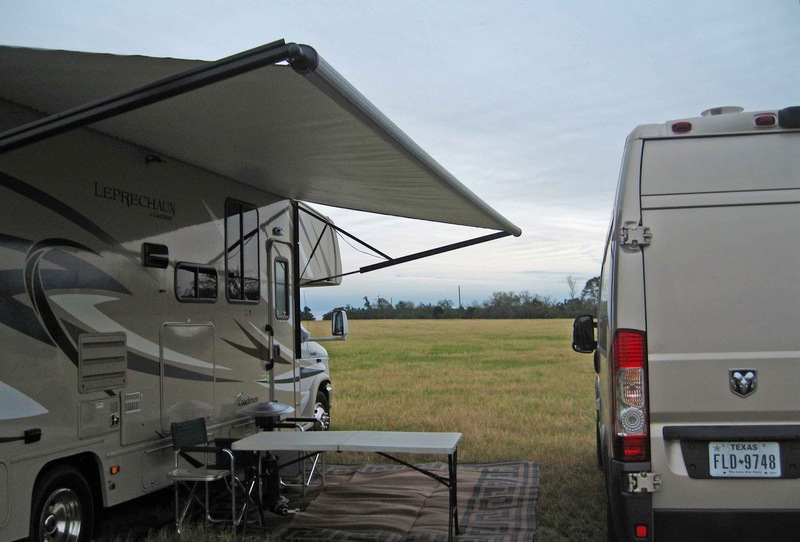 Our reward at base camp is hay, feed, and Chef Boyce's special New Years dinner of blackeyed peas, ham, skillet cornbread and steamed buttered cabbage. I didn't bring my camera (can't shoot photos while riding), but Sally has an iPhone and she took this photo of me finishing the 12 miles. Instead of carrying water in a saddle-bag, I carry my water on a camelbak which I use for other sports, too. 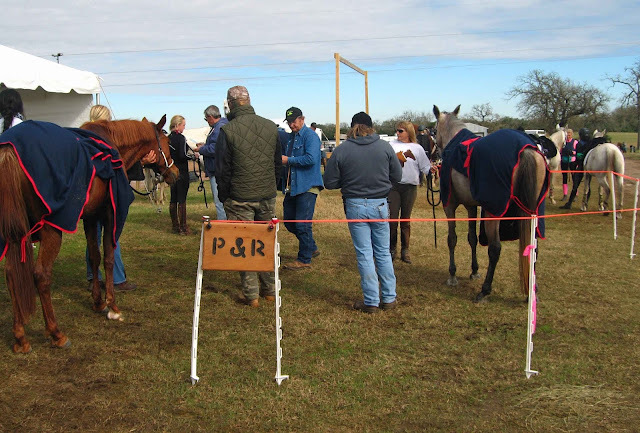 All riders must stop at the vet check station for a post-ride evaluation. There were three vets there who did the heart and gut checks plus checked for any lameness or sores. 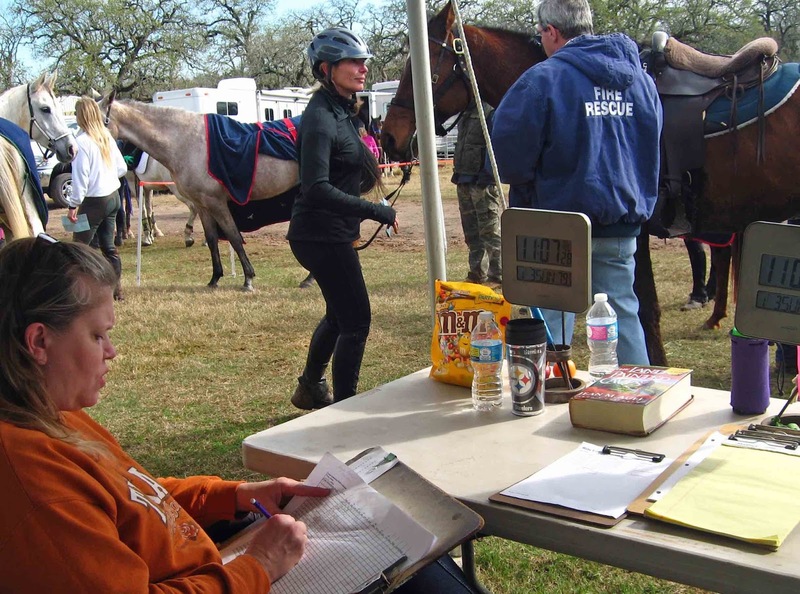 They called out their checks to two assistants at the table who kept records on each horse and rider. At the evening's meeting, we honored the top ten winners of the 50-miler event. Notice the two youngsters in photo below? They're about eight years old! Everyone got t-shirts, including Sally and me.